We all want a land with the environment as it should be, unpolluted by the trash, clear crisp horizons, green healthy forest. If this is how we feel for the physical world how much more for spiritual. Oh, for a land where rightness and justice stretch from horizon to horizon. Where love and faithfulness flow unending from God to sustain life in all its abundance. The problem is me, I have pride, lust, selfishness, and other faults that hold me captive, and if I were permitted to enter would spoil the land of my dreams. In Jesus Christ I have a way to regain my innocence and purity, a new creation never to be a blemish again. I can enter into God’s presence and be part of the joy. This is ours, just for the asking. 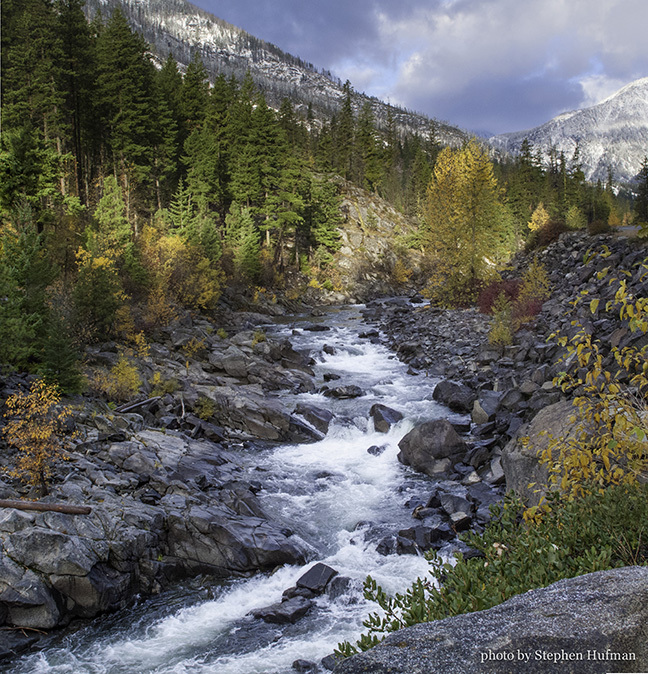 This entry was posted in Photography and tagged 2 Corinthians 5:17, Autumn, devotional, Icicle Creek, landscape photography, new life, Psalm 89:14, purity by Stephen Hufman. Bookmark the permalink. Stephen, this photograph is compelling, and your encouraging reminder about God’s free gift of grace including making us new is needed and appreciated! Thanks, I share from what God is doing in my life.